Ever since FastCompany wrote about their experiments to get off the grid for a while, #unplug has become the term for a reverse-trend to the digital. People from all over the web started writing about their own experiences with taking time off of internet and social media. Stories about ways to beat your digital addiction pop up daily now (e.g. A Trip to Camp to Break a Tech Addiction). However, we have to move beyond this discussion and find a way in between. ( OFFTIME ), a post-tech start-up from Berlin who is active in this field, next to promoting the discourse, are developing an app for which they also run a crowd funding campaign at the moment. Along with several co-organizers, I founded the English-speaking Berlin Quantified Self Meetup Group this October 17th. With this group, we want to organize meet-ups at the same level as other European metropolises in the future. The first meeting of our new Berlin group will take place on the 22nd of November. Amongst the speakers, there will be two well-known people from the Quantified Self scene. Steven Dean is a designer, a lecturer at the New York University and an entrepreneur in the digital health sector. In addition, Dean is a partner of the incubator PREHYPE and the organizer of the New York QS group. 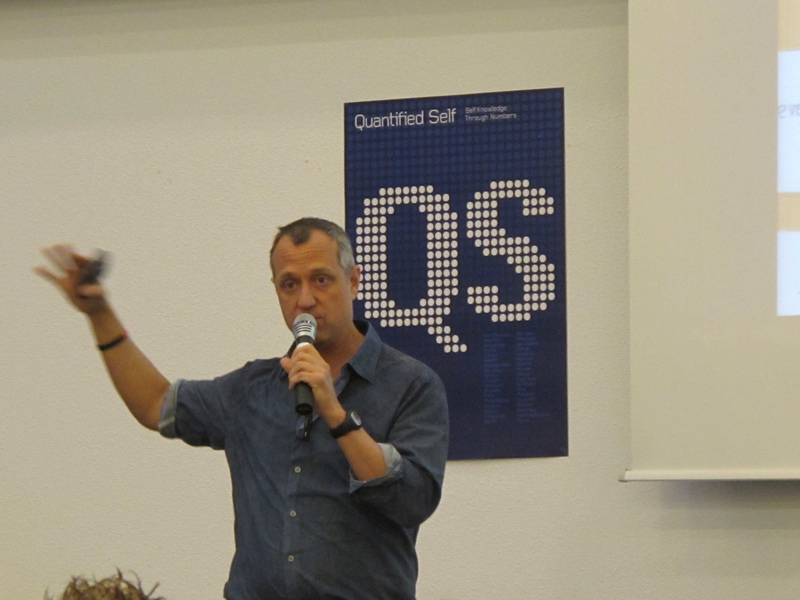 At the Berlin meet-up, Dean will give a keynote speech about the history and background of Quantified Self and will report how he used self-tracking to help prepare himself for an Iron Man competition. Denis Harscoat is the founder of the start-up company DidThis and a co-organizer of the Paris and London QS groups. He is particularly interested in habits and the regular practice of the behavior necessary to achieve mastery in a certain field. At the Berlin meeting, Harscoat will be talking about self-tracking behavior, the “programmable self” and how self-tracking keeps him motivated to change his lifestyle. Aside from the international guest speakers, the Berlin scene will also get their chance to speak up. Peter Lewis is one of the co-organizers of the new Berlin Quantified-Self group und a developer of educational apps designed after the “spaced repetition” principle (SRS). This method takes account of the human memory retention, thus helping to optimize efficiency in learning new contents. At the new group’s meet-up, Lewis will be talking about various SRS algorithms, their potential for future applications and his personal experience in learning new things with this method. Next to these contributions, the developers of self-tracking applications will also present their position towards personal data, self-awareness and behavioral changing. After the presentations, there will be a demo-hour, in which the visitors will be able to collect information about Berlin start-ups from the QS-scene. All self-trackers, those interested to learn more about QS and press representatives are warmly welcomed to join us at the meet-up on November 22nd. You can find more information about the new group and about the event here. If you are planning a trip to Berlin and would like to present a Show&Tell at one of our future meetups, please contact us. We are looking forward to welcoming further international speakers. Hi there! This blog is all about personal development in the age of mobile and connected devices. We are a group of tech enthusiasts who are particularly keen on personal development, and since we enjoy testing any and all new gadgets, apps and software services on ourselves, we figured it was time to share our insights with you. Welcome to our blog. Unlike other reviews you might find on the web, this blog offers you not only regular updates from a technological point of view, we will also share our personal experience with you on how using the products impacted our own personal development. We will review trends and upcoming products, discuss software and biosensors already available, and in some cases, we will also cover software that wasn’t even actually intended for personal development goals, but still does a great job for self improvement, if you know how to use it just right. The possibilities are endless. Unleash the potential of your digital products for your personal growth.